This past May, many of us celebrated the 70th anniversary of VE Day – or Victory Europe Day – the day that marked the end of the Second World War on the European Continent. Owen Cornish, 92, was there in person on May 8, 1945, flying missions as pilot of a Halifax, a massive four-engine bomber. His overseas work both as an operational pilot and as a flight instructor for the Royal Air Force has rightly been noted and celebrated, but his connections to the Edmonton flying community are less well known. This was followed by Elementary Flying Training School at Blatchford Field, on the site of the recently closed Municipal Airport on Kingsway Avenue. They flew open-cockpit Tiger Moths here, which was to Owen “everything I’d hoped it would be.” While he was in training, he stayed in the residence halls at the U of A. He liked Edmonton so much he returned here after the war to study Dentistry at U of A, then the only Dental School in Western Canada. 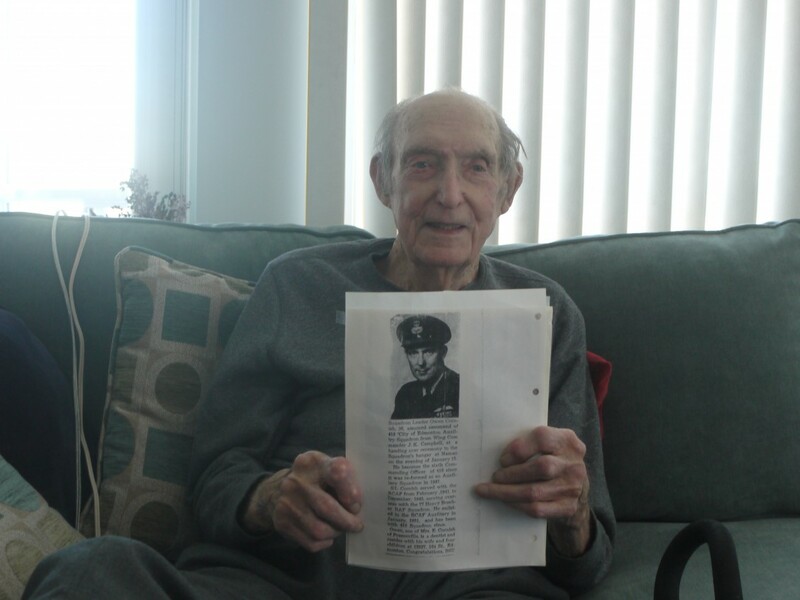 In September 1950, he joined the 418 RCAF Reserve Squadron, which he enjoyed, but also helped put food on the table for his young, growing family. “It was an active Reserve Squadron. We were there in case Russian Bears came over the Pole,” he recalls of the Cold War era work in the hangar that now houses the Alberta Aviation Museum. The ‘Bears’ were Tupolev Tu-95s, a large, four-engine turboprop-powered airplane used as a strategic bomber, missile carrier, and surveillance aircraft. Luckily, he notes, he and his fellow reservists “never had to prove ourselves that way,” as no Bears appeared over the skies of Edmonton. This was especially good considering the equipment the squadron had at its disposal. While Owen tells stories like these with mirth now, he admits it was the near misses and faulty equipment that eventually convinced him to leave the squadron. “In the event that I was killed, my wife with our four kids would have gotten only $75,000 dollars – that was it. Regular force, of course, you’d have a pension,” he says.